Ad tech is killing the online experience | Felix Salmon … | adaptifyed™ The Adaptifyed system for monetizing downloadable files is covered by U.S. patents: US9451011B2, US14318109, US15243350, and pending application: US20150007256A1. 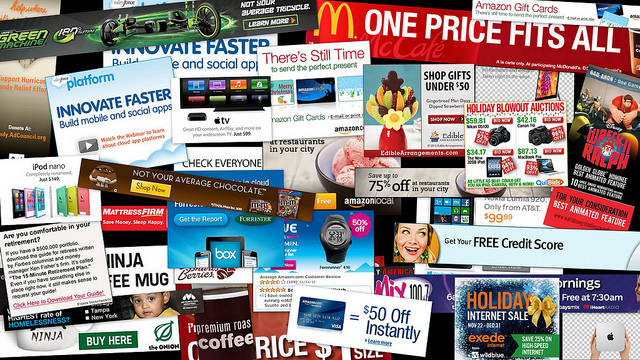 The image above represents the number of ads one user sees in about 1/2 hour on the Internet. I actually think that the image is probably light from my own experience. Ads have become so cluttered that we can barely find the content we’re looking for. Something has to give at some point. We all need to take a look at how we can adjust the user experience, so that it becomes a pleasure again. There’s something so wonderfully easy about reading this column in a physical newspaper. You turned the page, and here it is, with few annoyances or distractions, in an ultra-high-definition typeface which was custom-designed with pleasurable reading in mind. Or – wait – are you reading this on a phone? Did you follow a link from Twitter, or Facebook? Or maybe you’re on a train, or a plane, or you’re trying to use your laptop on your cousin’s crappy Wi-Fi connection out in the countryside somewhere. In which case, there’s a pretty good chance that even getting this far is some kind of minor miracle. Web-based articles, these days, are increasingly an exercise in pain and frustration. In many ways, the experience of reading such things is worse today than it was in the early days of dial-up internet. Because at least back then web pages were designed with dial-up users in mind. They were mostly text, and even if they used images, the text always loaded first. Today, by contrast, everything is built for a world where everybody has a high-bandwidth supercomputer in their pocket. That’s not because we all do have high-bandwidth supercomputers in our pockets, although the web technologists who are building these sites generally do, and have a tendency to forget about everybody else. Rather, it’s a function of misaligned incentives. When it comes to the economics of online publishing, the first thing to remember is that job No 1 isn’t to get the news to you. Rather, it is to monetise you, by selling you off, in real time, to the highest bidder. This happens every time you click on a link, before the page has even started to load on your phone. Once upon a time, if you and I both visited the same web page at the same time using the same web browser, we would end up seeing the same thing. Today, however, an almost unthinkably enormous ecosystem of scripts and cookies and auctions and often astonishingly personal information is used to show you a set of brand messages and sales pitches which are tailored almost uniquely to you. That ecosystem raises important questions about privacy and just general creepiness – the way that the minute you look at a pair of shoes online, for instance, they then start following you around every other website you visit for weeks. But whether or not you value your privacy, you are damaged, daily, by the sheer weight of all that technology. Gruber blamed iMore.com, but really it’s not the website’s fault, since to a very large degree the owner of the website you’re visiting doesn’t actually control what you see, when you see it, how you see it, or even whether you see it. Instead, there are dozens of links in the advertising-technology chain, and every single one of them is optimising for financial value, rather than low-bandwidth user experience. Many pages, if you’re on a slow connection, simply time out; they never load at all.